Marilyn Monroe (Juin 1, 1926 – August 5, 1962) wis an American film actress. In 1999, Monroe wis rankit as the saxt greatest female actress o aw time bi the American Film Institute. 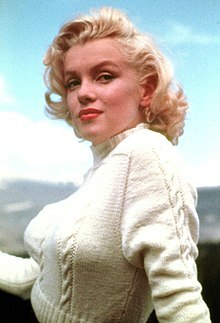 Her birth name wis Norma Jean Mortenson an she wis born on Juin 1, 1926, in Los Angeles, Californie. She deit o a drog overdose on the nicht o August 5, 1962, in Brentwood, Californie. She wis marrit tae basebaw player Joe DiMaggio durin 1954. She marrit Arthur Miller (a playwright) Julie 1, 1956. Thay divorced Januar 21, 1961. ↑ 3.0 3.1 "Marilyn Monroe Biography (1926-1962)". www.filmreference.com. This page wis last eeditit on 2 Juin 2018, at 14:46.